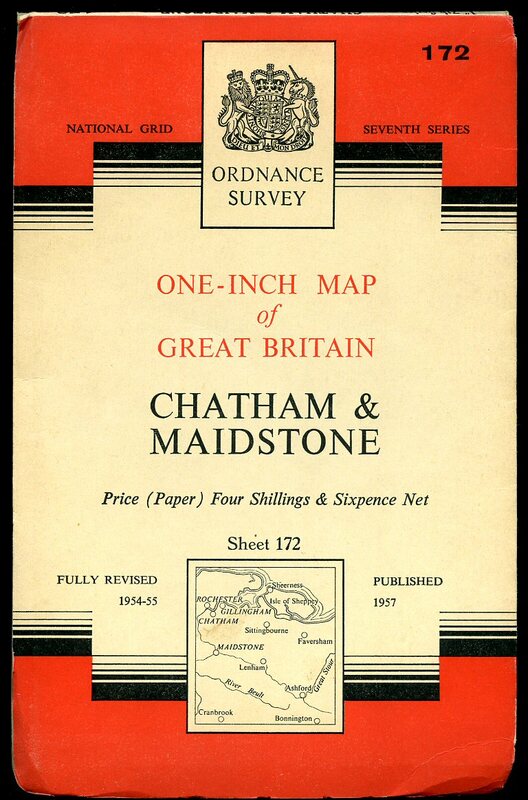 Published by Ordnance Survey Office Chessington, Surrey 1957. 1957. 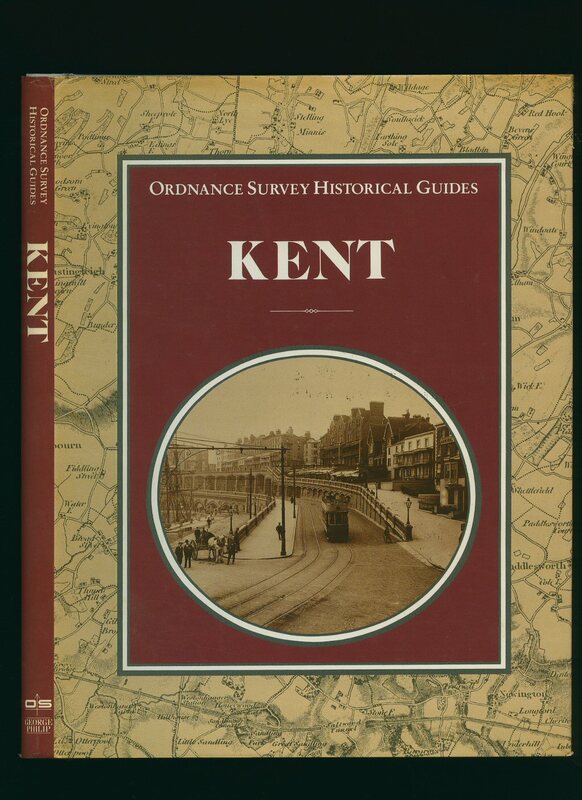 Published by George Philip & Son Ltd., London and Ordnance Survey, Southampton First Edition 1988. First edition hard back binding in publisher's original grey cloth covers, silver lettering to spine. 8vo 10'' x 8'' 136 pp ISBN 0540011347. Colour and monochrome illustrations, 47 maps. Fine condition book in near Fine condition dust wrapper with 25 mm closed tear to top of upper fore edge, not price clipped. Dust wrapper supplied in archival acetate film protection. Member of the P.B.F.A. 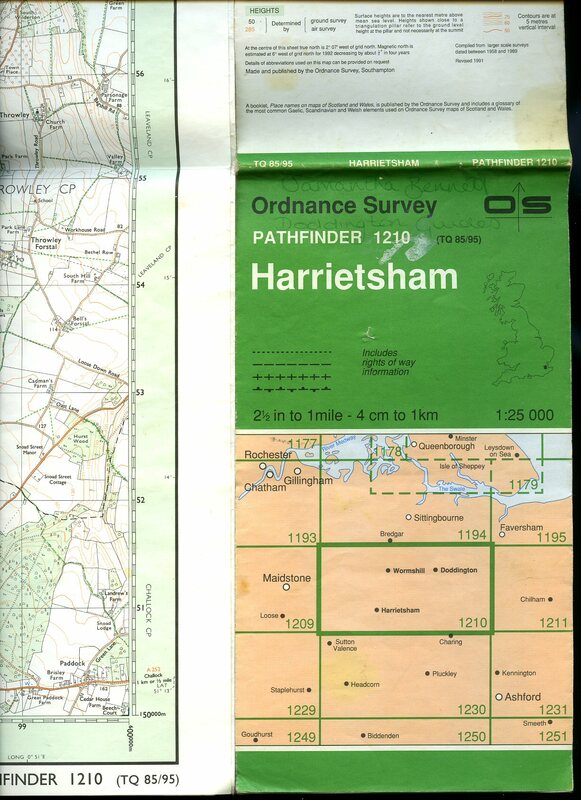 Published by Ordnance Survey, Southampton 1992. Southampton 1992. Fold-out green and white paper map. Scale 1: 25 000. Minor soiling to the lower cover, name to the top of the front cover and in Very Good condition. Member of the P.B.F.A. 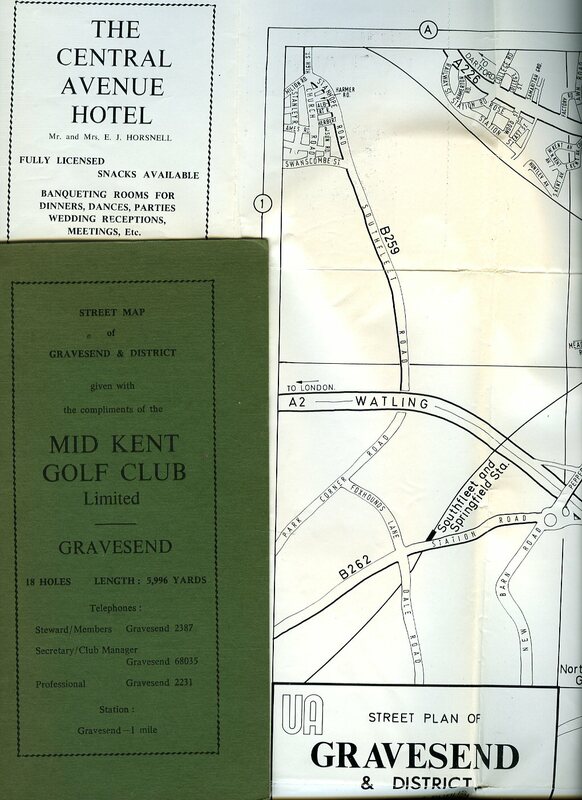 Street Map of Gravesend and District Given With the Compliments of the Mid Kent Golf Club Ltd. Published by The United Advertising Co. Whetstone, London circa 1970 edition not stated. 1970. Green card covers with 24 section fold-out map opening to 22½'' x 30'' with local advertisements around the edges. Couple of short tears to the top folded line otherwise in Very Good clean condition with the Mid Kent Golf Club complements and Club details to the front cover. Member of the P.B.F.A. First edition in publisher's original stapled ivory card covers, black lettering to upper panel. 4to 10'' x 7½'' 30 printed pages of text, Sheet 173 one-inch colour map enclosed. Monochrome photographic illustrations on glossy silk art paper. In Fine condition. Member of the P.B.F.A. 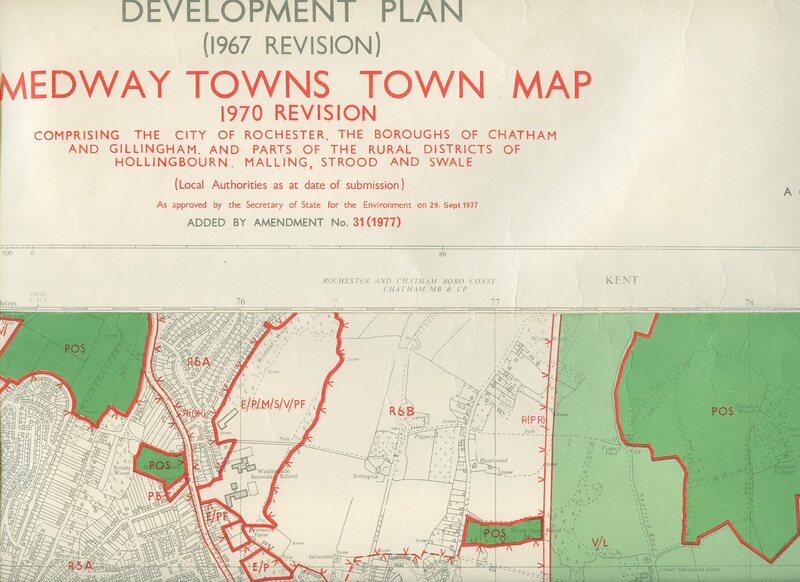 Published by Kent County Council, Maidstone 1973. 1973. Publisher's original thick grey card covers. Folio 12'' x 8¼'' xiv, 288 [pp] ISBN 900947381. Colour and monochrome illustrations throughout. 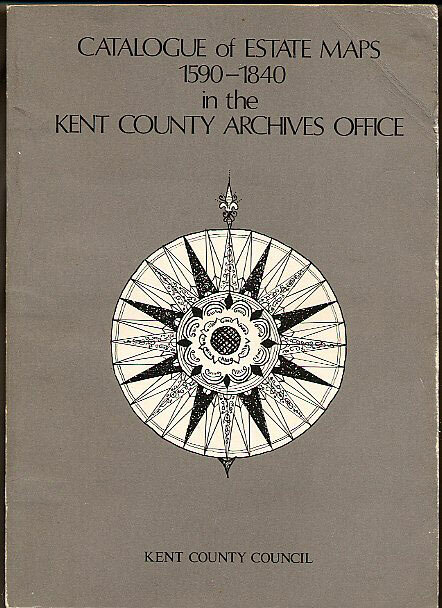 Many of the estate plans made in Kent during some 300 years of land surveying, 1575-1875, have found a secure home in the Kent County Archives Office. Creasing of the card to the spine, crease line across top corner to the front cover and in Very Good clean condition, no dust wrapper as published. Member of the P.B.F.A. Published by Geographia Ltd., Fleet Street, London circa 1950 edition not stated. London circa 1950. Light green card covers. 20'' x 26''. 18 section paper folding map with detail in green and red. ¾'' to the mile. In Very Good condition. Price 1/- to the front cover. Member of the P.B.F.A. Morden, Robert [Robert Morden (c. 1650 - 1703) was an English bookseller, publisher, and maker of maps and globes. He was among the first successful commercial map makers]. Uncoloured copper engraved map 8½'' x 7¼'' inches. Commonly referred to as 'Miniature Morden's' this map was printed as part of 'Fifty Six New and Accurate Maps of Great Britain' published in conjunction with Herman Moll in 1708. 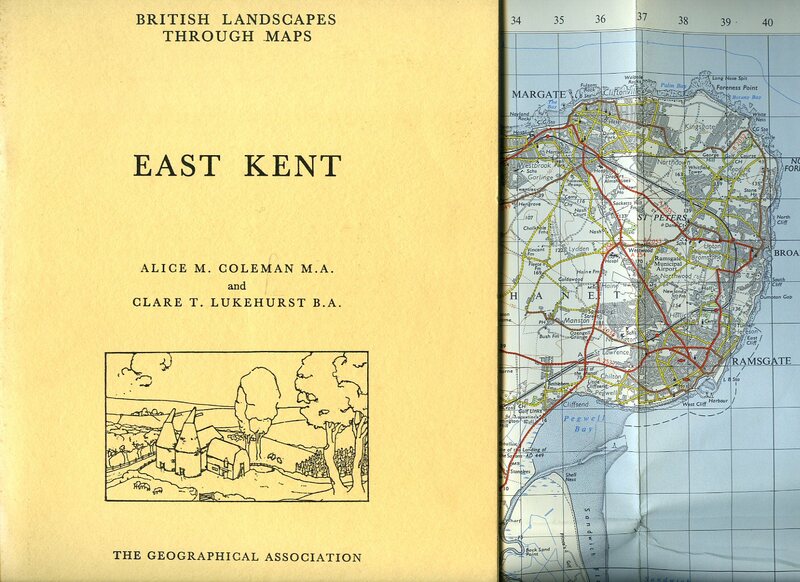 Mounted on contemporary paper with a brown stain to the verso of the right hand margin of the mounting paper, (not the map), folded lines across the top and bottom margins of the map, records society label to the reverse of the map. Member of the P.B.F.A. Published by Crown Copyright 1971. Rolled paper map opening to 26½'' x 21½'' drawn with red and green detail, scale six inches to one mile. The complete Town Map comprises 9 sheets. This is sheet TQ 86 NW, we have two of the other eight sheets in stock. Small tears to the edges. Member of the P.B.F.A. Rolled paper map opening to 26½'' x 21½'' drawn with red and green detail, scale six inches to one mile. 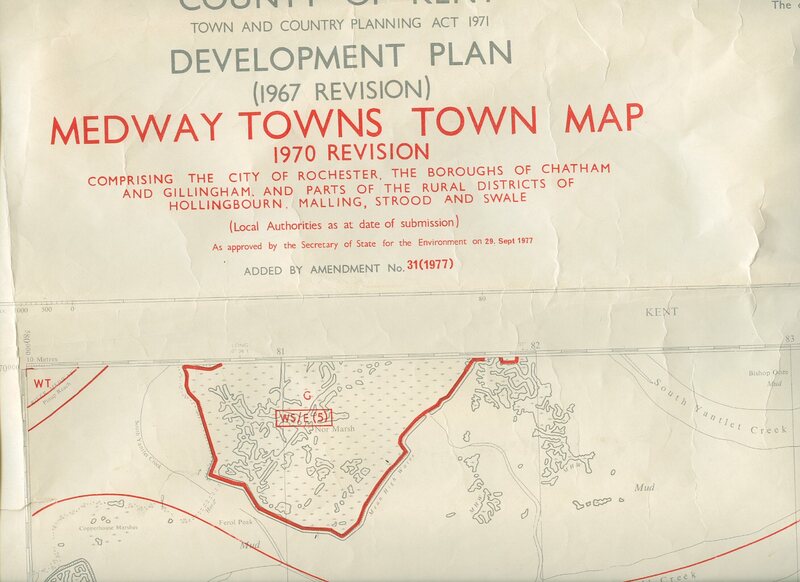 The complete Town Map comprises 9 sheets. This is sheet TQ 76 SE, we have two of the other eight sheets in stock. Small tears to the edges. Member of the P.B.F.A. Published by T. Badeslade and W. H. Toms September 29th 1741. 1741. Mounted hand-coloured map measuring 6'' x 6''. Text to the side gives details of 2 cites, 2 boroughs, sends 10 members; including 4 of the Cinque Ports, which sends 8 Barons to Parliament, make in all 18. 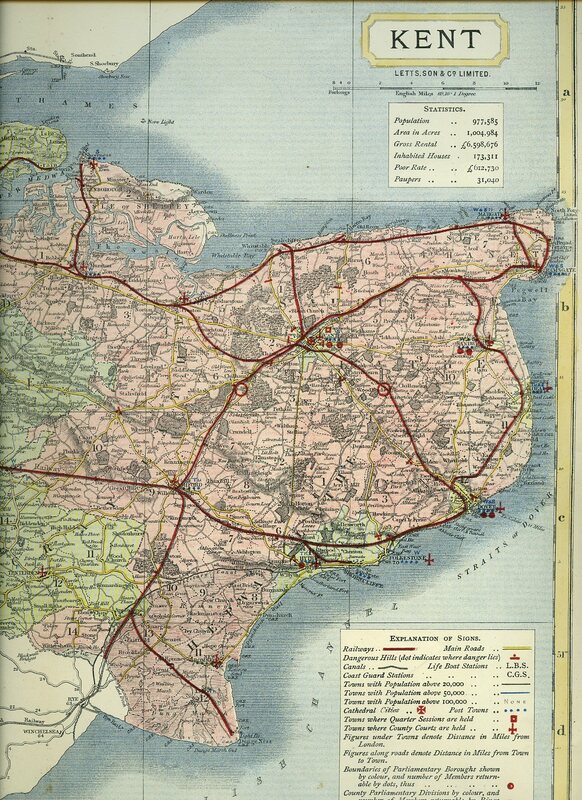 It has likewise 24 Market Towns, and 408 Parishes. It lists the Cities, Market Towns with days of the Market. Surrey spelt 'Surry.' Extremely scarce and in near Fine condition. Member of the P.B.F.A. The hundred of Wachlingstone encompasses the lowy of Tunbridge on the east, west, and south sides of it. It is written in the survey of Domesday, Warchelestan. Bayly Sculp. London circa 1770. 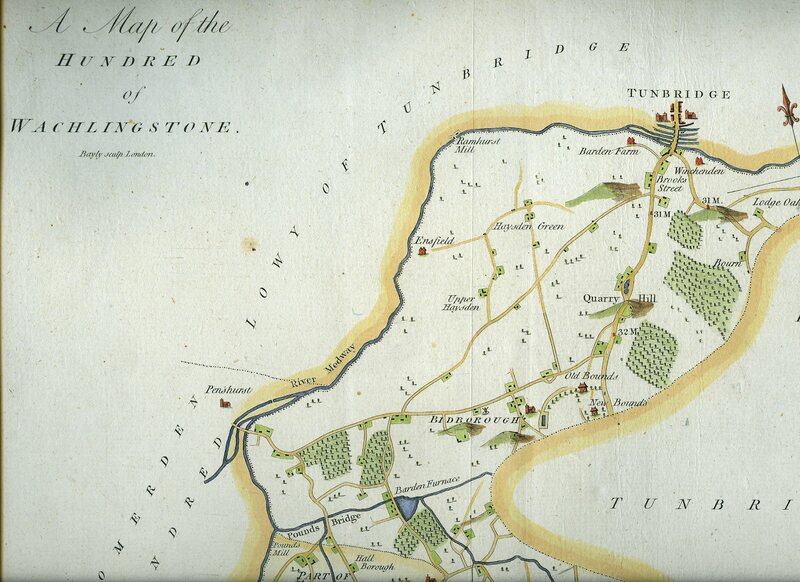 London circa 1770. 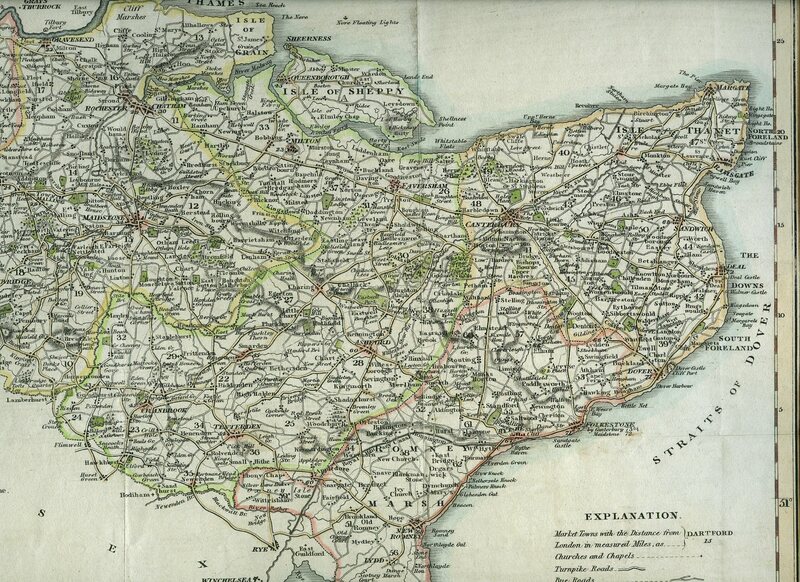 Hand-coloured map measuring 21'' x 16½''. 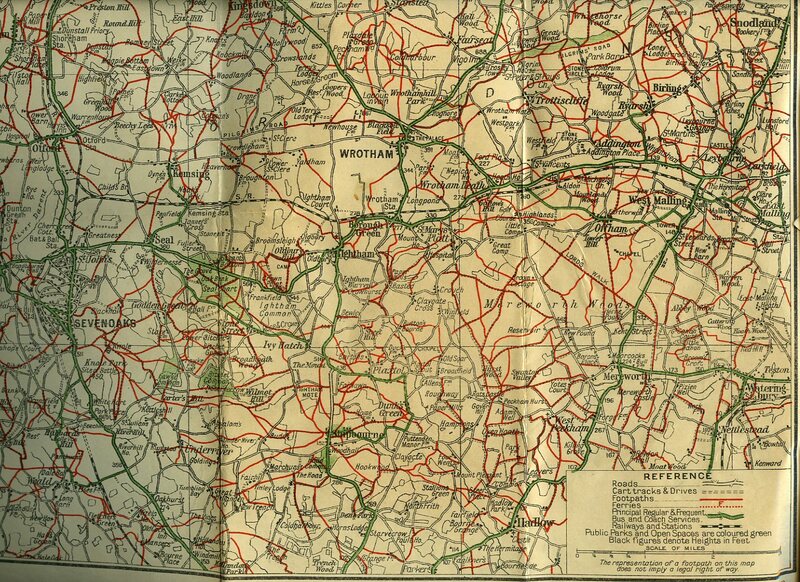 Somerden Hundred to the West, Brenchley and Horsemonden Hundred to the East, Tunbridge to the North, Tunbridge Wells to the South. Without any tears and in clean fresh condition. Member of the P.B.F.A. Published by G. Virtue, 26 Ivy Lane, London 1829. London 1829. 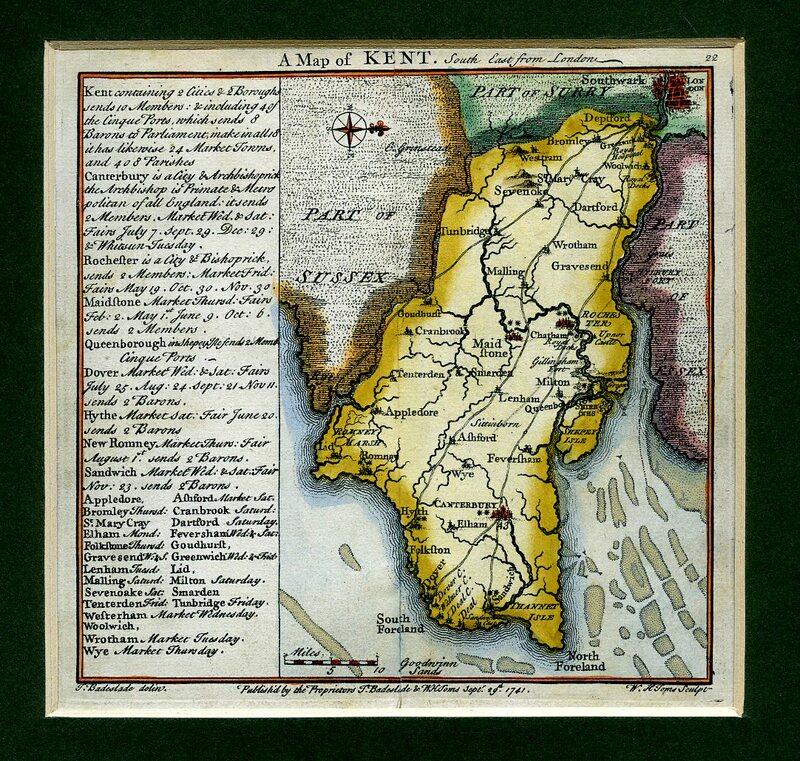 Hand-coloured map of Kent measuring 17'' x 14''. Scale 3'' to 12 miles. One small professionally repaired tear to the bottom left corner and in Very Good clean and fresh condition. Member of the P.B.F.A. Published by G. W. Bacon, London 1884. London 1884. 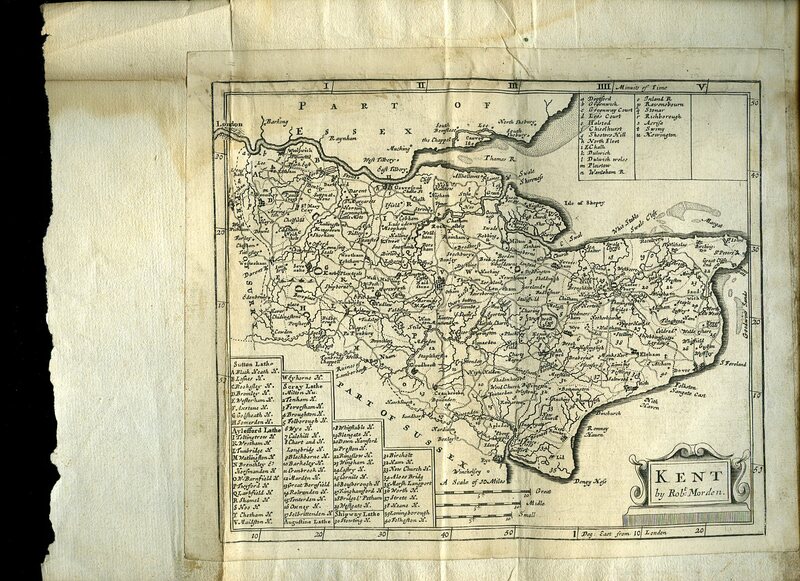 Coloured map of Kent measuring 13½'' x 21''. Divided into 5 mile squares. Official names of Railway Stations are all engraved in a special character, thus, Clayton; except where indicated by the name of the town being in bold letters and identical with the name of the Station. Folded line down the centre and in Very Good clean condition. Member of the P.B.F.A. Published by Letts, Son & Co. London Bridge 1884. London 1884. 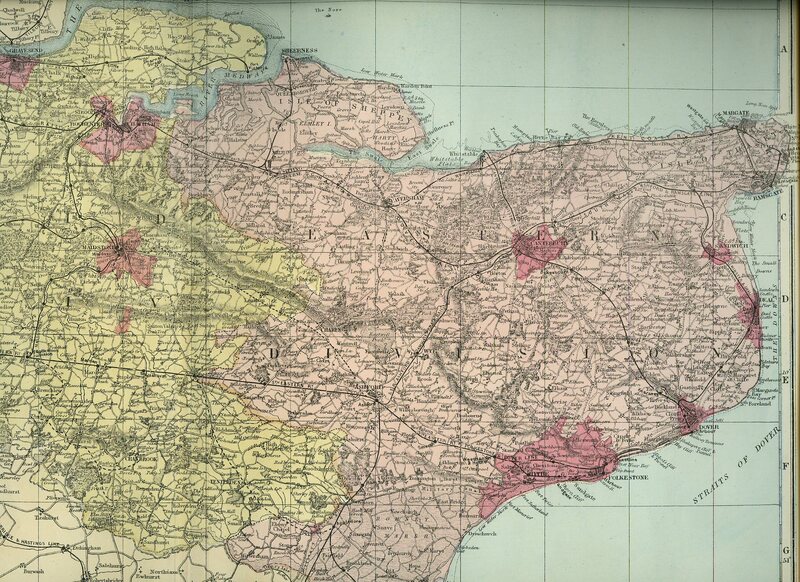 Coloured map of Kent measuring 17'' x 14''. Inset statistics, Explanation of Signs. Two small repaired tears to the reverse centre fold, in Very Good clean and bright condition. Member of the P.B.F.A.